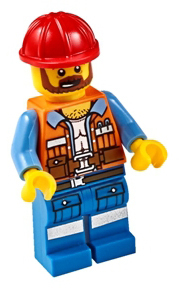 Frank the Foreman is a minifigure released in 2014 as part of the LEGO Movie theme. He is the foreman of construction at the site where Emmet works. This is a description taken from LEGO.com. Please do not modify it. (visit this item's product page) A veteran of years of building, and the minifigure in charge of the Bricksburg construction crew. Frank knows how important it is to follow the rules and make new buildings exactly according to the instructions. But as a good boss, he also knows that his workers need to have fun, so he doesn’t mind if they sing while they build, or chat about the latest episode of “Where Are My Pants?”, as long as they get the job done on time. Facts about "Frank the Foreman"
A veteran of years of building, and the minifigure in charge of the Bricksburg construction crew. Frank knows how important it is to follow the rules and make new buildings exactly according to the instructions. But as a good boss, he also knows that his workers need to have fun, so he doesn’t mind if they sing while they build, or chat about the latest episode of “Where Are My Pants?”, as long as they get the job done on time.